Mainstream in parts of Southeast Asia, limited success elsewhere. Kulintang is a modern term for an ancient instrumental form of music composed on a row of small, horizontally-laid gongs that function melodically, accompanied by larger, suspended gongs and drums. As part of the larger gong-chime culture of Southeast Asia, kulintang music ensembles have been playing for many centuries in regions of the Eastern Malay Archipelago — the Southern Philippines, Eastern Indonesia, Eastern Malaysia, Brunei and Timor, although this article has a focus on the Philippine Kulintang traditions of the Maranao and Maguindanao peoples in particular. Kulintang evolved from a simple native signaling tradition, and developed into its present form with the incorporation of knobbed gongs from Sunda. 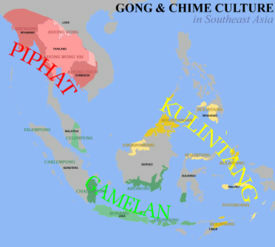 Its importance stems from its association with the indigenous cultures that inhabited these islands prior to the influences of Hinduism, Buddhism, Islam, Christianity or the West, making Kulintang the most developed tradition of Southeast Asian archaic gong-chime ensembles. Technically, kulintang is the Maguindanao, Ternate and Timor term for the idiophone of metal gong kettles which are laid horizontally upon a rack to create an entire kulintang set. It is played by striking the bosses of the gongs with two wooden beaters. Due to its use across a wide variety groups and languages, the kulintang is also called kolintang by the Maranao and those in Sulawesi, kulintangan, gulintangan by those in Sabah and the Sulu Archipelago and totobuang by those in central Maluku. Because kulintang-like ensembles extended over various groups with various languages, the term used for the horizontal set of gongs varied widely. Along with it begin called kulintang, it is also called kolintang, kolintan, kulintangan, kwintangan, k’lintang, gong sembilan, gong duablas, momo, totobuang, nekara, engkromong, kromong/enkromong and recently kakula/kakula nuada. Kulintang-like instruments are played by the Maguindanao, Maranao, Iranun, Kalagan, Kalibugan and more recently the Tboli, Blaan and Subanao of Mindanao, the Tausug, Samal, Sama/Badjao, Yakan and the Sangir/Sangil of the Sulu, the Ambon, Banda, Seram, Ternate, Tidore, and Kei of Maluku, the Bajau, Suluk, Murut, Kadazan-Dusan, Kadayah and Paitanic Peoples of Sabah, the Malays of Brunei, the Bidayuh and Iban/Sea Dayak of Sarawak, the Bolaang Mongondow and Kailinese/Toli-Toli of Sulawesi and other groups in Banjarmasin and Tanjung in Kalimantan and Timor. The instrument called the “kulintang” (or its other derivative terms) consist of a row/set of 5 to 9 graduated pot gongs, horizontally laid upon a frame arranged in order of pitch with the lowest gong found on the players’ left. The gongs are laid in the instrument face side up atop two cords/strings running parallel to the entire length of the frame, with bamboo/wooden sticks/bars resting perpendicular across the frame creating an entire kulintang set called a pasangan. The gongs could weigh roughly from two pounds to three and 1/8 pounds and have dimensions from 6–10 inches for their diameters and 3–5 inches for their height. Traditionally they are made from bronze but due to the shortage of bronze after World War II, and the subsequent use of scrap metal, brass gongs with shorter decaying tones have become commonplace. The kulintang frame known as an antangan by the Maguindanao (means to “arrange”) and langkonga by the Maranao could have designs that could be particularly crude made from only bamboo/wooden poles or highly decorated, rich with artistic designs like the traditional okil/okir motifs or arabesque designs. It is considered taboo to step or cross over the antangan while the kulintang gongs are placed on it. The kulintang is played by striking the bosses of the gongs with two wooden beaters. When playing the kulintang, the Maguindanao and Maranao would always sit on chairs while for the Tausug/Suluk and other groups that who play the kulintangan, they would commonly sit on the floor.Modern techniques include twirling the beaters, juggling them in midair, changing the arrangement of the gongs either before or while playing, crossings hands during play or adding very rapid fire strokes all in an effort to show off a player’s grace and virtuosity. Kulintang gongs are made using the cire perdue method, a lost-wax process used for casting the individual gongs. The first phase is the creation of wax molds of the gongs. In the past, before the availability of standardized wax sheets made specifically for foundry use, the molds were made out of either beeswax (talo) or candle wax (kandila). The wax mold is covered with a special mixture of finely-powdered coal/mud, which is applied on the wax surface using a brush. The layers are then left to dry under the sun, after which the entire mold is heated in a furnace to melt away the wax and hardening the coal/mud mixture, leaving behind a hollowed shell. With this hardened mold, molten bronze is poured down the mold’s mouth cavity, cooled to a certain degree, then the coal/mud is broken apart, revealing a new gong. The gong is then refined, cleaned, and properly identified by the panday (gong-maker). Finally, the finished product is refined using the tongkol process, tuning the gongs either by hammering the boss from the inside to slightly raise its pitch, or by hammering the boss from the outside to lower the pitch. The correct tuning is found by ear, with players striking a sequence of gongs, looking for a melodic contour they are familiar with. The kulintang is traditionally considered a women’s instrument by many groups: the Maguindanao, Maranao, Tausug/ Sukul, Samal, Badjao/Sama, Illanum, Kadazan, Murut, Bidayuh and Iban. Traditionally, the playing of the kulintang was associated with graceful, slow, frail and relaxed movements that showed elegance and decorum common among females. Nowadays, with both women and men playing all five instruments, the kulintang seen strictly as a woman’s instrument has waned, and in fact today, the most well known players of the kulintang happen to be men. A kulintang ensemble performance in Daly City, California. The main purpose for kulintang music in the community is to function as social entertainment at a nonprofessional, folk level. This music is unique in that it is considered a public music in the sense everyone is allowed to participate. Not only do the players play, but audience members are also expected to participate.These performances are important in that they bring people in the community and adjacent regions together, helping unify communities that otherwise may not have interacted with one another. Traditionally, when performers play kulintang music, their participation is voluntary. Musicians see performances as an opportunity to receive recognition, prestige and respect from the community and nothing more. Kulintang music generally could be found as the social entertainment at a host of different occasions. It is used during large feasts, festive/harvest gatherings, for entertainment of visiting friends and relatives, and at parades. Kulintang music also accompanies ceremonies marking significant life events, such as weddings and returnees from the Hajj. Kulintang music also plays a significant role during state functions, used during official celebrations, entertaining of foreign dignitaries and important visitors of distant lands, court ceremonies of either the sultanate or village chieftains,enthroning/coronations of a new leader and the transferral of a sultanate from one family to another. Kulintang music is prohibited from being played inside mosques and during Islamic rites/observances/holidays, such as the fasting month (Ramadhan), where playing is only allowed at night during the time when people are allowed to eat. It is also prohibited during the mourning period of the death of important person, during funerals, and during the peak times of the planting and harvest season. Kulintang music was also crucial in relation to courtships due to the very nature of Islamic custom, which did not allow for unmarried men and women to intermingle. Traditionally, unmarried daughters were kept in a special chamber in the attic called a lamin, off-limit to visitors and suitors. It was only when she was allowed to play during kulintang performances that suitors were allowed to view her. Because of this, kulintang music was rare socially approved vehicles for interaction among the sexes. The kulintang player’s ability to improvise within the parameters of a rhythmic mode is a must. As with gamelan orchestras, each kulintang mode has a kind of theme the kulintang player “dresses up” by variations of ornamentation, manipulating segments by inserting repetitions, extensions, insertions, suspensions, variations and transpositions. This occurs at the discretion of the kulintang player. Therefore, the kulintang player functions not only as the one carrying the melody, but also as the conductor of the entire ensemble. She determines the length of each rendition and could change the rhythm at anytime, speeding up or slowing down, accord to her personal taste and the composition she plays. This emphasis on improvisation was essential due traditional role of the music as entertainment for the entire community. Listeners in the audience expected players to surprise and astound them by playing in their own unique style, and by incorporating improvisation to make newer versions of the piece. If a player simply imitated a preceding player, playing patterns without any improvisation, the audience members would believe she/he to be repetitious and mundane. This also explains why set performance pieces for musical productions are different in some respect — young men/women would be practicing before an event, therefore rarely relying on improvisations.